WOODSTOCK, Ill. (WLS) -- Police are looking for the man who robbed two gas stations and a liquor store far northwest suburban Woodstock. A Shell gas station located at 315 North Madison Street was robbed around 10:05 p.m. Saturday. The Gas Cap Citgo station located at 401 South Eastwood Drive was robbed around 8:30 a.m. Sunday. Sunrise Food and Liquors located at 715 McHenry Avenue was robbed around 7:50 p.m. Sunday. Police released surveillance photos of the Citgo and Sunrise Food and Liquor incidents. 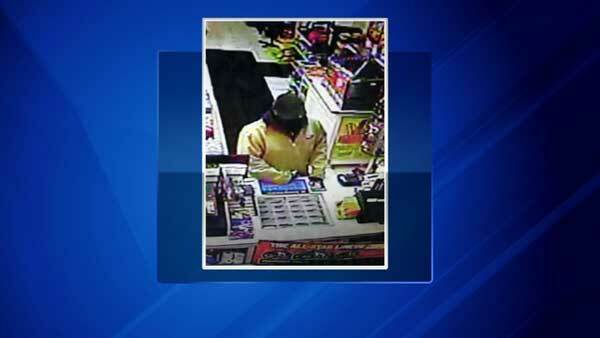 Police are looking for the man who robbed two gas stations and a liquor store far northwest suburban Woodstock. Authorities said the suspect entered wearing a black ski mask and flashed a handgun at the cashier, demanding money. They said he then jumped into a getaway car. No one was hurt in any of the incidents. Police are linking all three armed robberies together.